You should rephrase your statement more clearly. Better translated it would read: "I've never driven an 1800 Wing". Your reaction will be the same as everyone who never has, and then rides one in the twisties. They handle beautifully. And I'm sure the new one is even more spectacular regarding the cornering arena. I owned a C14 for six years, and I track a gsxr6 so I have good "other bike" benchmarks. Cornering ABS is a new technology that releases just enough braking force when tipped over to keep the front wheel from even starting to lose traction. As opposed to waiting for it to start losing traction. The reason this is important is for the same reason I see the sides of the racetrack littered with bikes every track day I attend. It's called "tuck", where the bottom of the front wheel flips out away from the turn 'cause there's just too much force on the contact patch to maintain traction. The "argument" against this will be the same as the original anti-ABS arguments I'm sure. "I'm good enough to handle these events on my own, I don't need this newfangled technology." Fair enough, but anything that keeps me safer is a good thing in my book. Storage. That'll be a tough one. Interesting to see what anyone comes up with. Bigger saddlebags and trunk would cost really big bucks and add lots of weight. Luggage rack- I already use one so that's a zero sum addition. I suppose if I ever do end up getting the bike It'll be easy enough just to carry soft bags into the hotel like we always do. It would be nice to pop it off for day rides though. Ya, saw those. Wonder if they'll stop the bike at 45 degrees with no damage like my current Wing? Dunno. WingCon, thanks for your explanation. However, keep your judgement regarding other people to yourself. Thank you very much. My comment was aimed at people who understand innocuous sarcasm. Remember everyone, this is just text. You can't accurately read emotion and intent in text. We are all trying to be friends here who love the same hobby. I looked closely at the introductory video and the "hard points" appear to be Top Block imitation sliders. The rear set is mounted on the tail pipe assembly, the front are on the engine cases. Really question their effectiveness. But I really like the look and other improvements of the new Wing. Oh my, here's an awesome link with lotso great pics of the colors and configs, I'm really diggin the grey with the chrome bits blacked out. Storage. That'll be a tough one. Interesting to see what anyone comes up with. If not on a trip the storage capacity will suffice for day rides and commutes, for longer trips just hook up the Unigo and more than double the capacity. Our current Unigo will match nicely the new grey color scheme. Yeah but a Uni-Go is pretty pricey plus you'll have to add the trailer hitch. My 2012 GL 1800 will easily haul clothing for two for an extended (2-3 weeks). Many, if not most, of these "improvements" (particularly the infotainment stuff) could have been phased in over the past decade (the GL1800 was introduced in 2001). The suspension upgrade addresses a long known issue and GWRRA members have long wondered why the windscreen wasn't electric. I'm unimpressed with the "sound." I really like that my bike is almost inaudible from 80' away. I guess the handwriting was on the wall when Honda introduced the F6B; a stripped-down "performance" 'wing. No it won't, it's off by just a little bit. You better preorder a complete set of plastic. Call the paint shop. Hope all is well buddy, been too long since I saw you last! Yeah but a Uni-Go is pretty pricey plus you'll have to add the trailer hitch. I scored my Unigo for $1500, $ well spent, it's awesome for hauling all our camping gear, I can't imagine trying to camp (glamp ) with out it. Summer 2018, hope to make a trip up on Razzi, but you may have to ride to Bend to visit us. Brent, good to see you posting. I read daily and post occasionally. 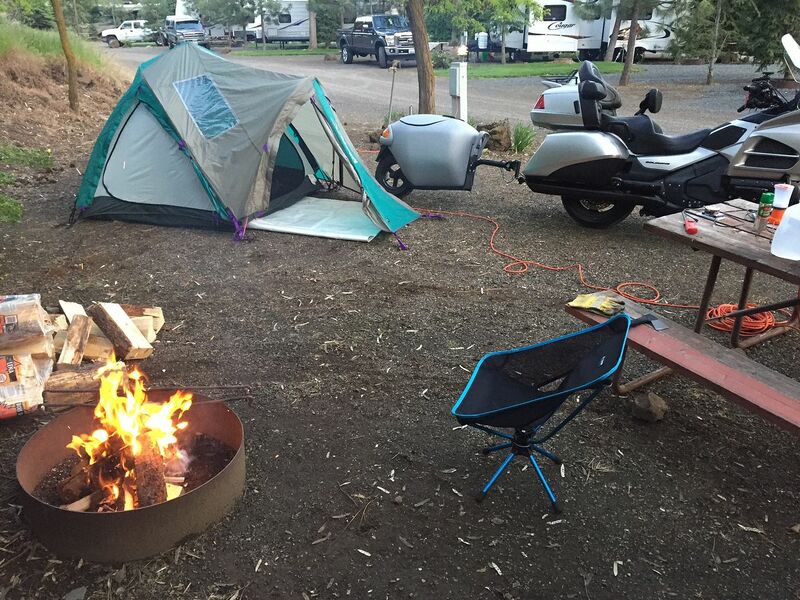 This pic was posted on the goldwingdocs.com forum. It's without the tupperware. Look independently mounted. If they'll stop the bike at about 45 deg or so with zero damage like my '03 then that's good. However, there are NO tip over bars in the rear to protect the saddlebags. Part of the vaunted weight savings. Without those rear tip over bars, that's going to be an expensive saddlebag lid replacement, and even worse if aftermarket or OEM comes out with deeper saddlebag lids. So get on the job aftermarket and get ready to lose some mpg and power/weight ratio. Have you found the Wing under powered WC? I ride occasionally with a GW; it's always been 2 up for the bikes. He can pass slow moving vehicles on narrow 2 lane roads with very short passing zones. Admittedly; it isn't 160 HP like the K1600GTL but the Wing won't cost $1200 for a service call. I had an 06 Wing whose cruise control was dead on pulling at 75 up a 4 mile hill on PA interstate 80. It did 110 across Kansas where the wind never stops. I was never the fastest bike on the road but I got where I wanted. Knowing Honda, most riders would find the new engine too boring cause it's too smooth. The loss of luggage space though is a crime. I always bristle at hearing crank HP on a shaft bike. K1600GT/GTL/B = 133hp at the wheel. Makes it seem a whole lot slower, yea? Well guys I think I've made the decision to go ahead and get one of these, am gonna either sell our 2016 Wing or trade it in, the new 2018 Wings are spose to hit dealers in February, I guess now I just wait and keep reading all the great stuff about them! The Japanese, being as history shows, probably made significant improvements on it. It’s probably going to be a fantastic bike but it’s way outa my paygrade. Oh, and as one more aside..... where are the vest power ports ((powerlet/BMW style), that can also be used for a battery tender), and where are the lane intrusion warning flashers on the mirrors? Congrats Jay! Please post the final deal if you care to. 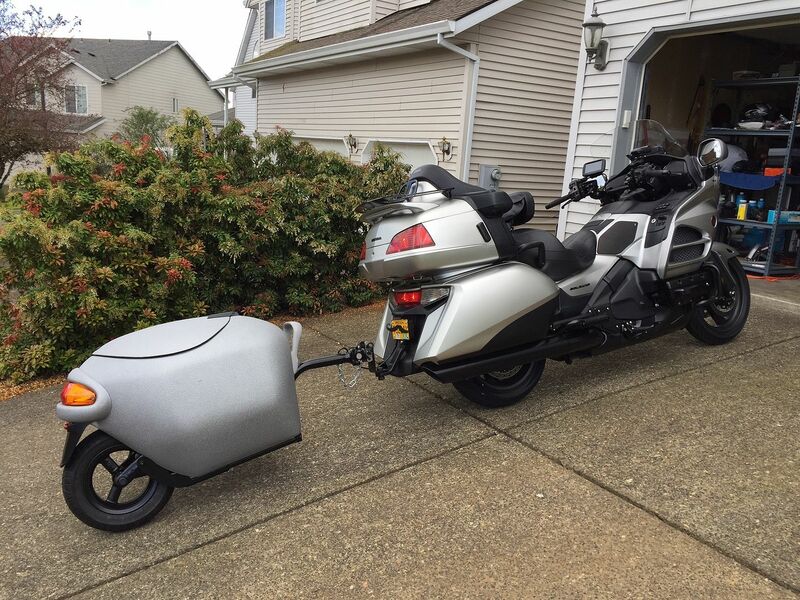 I think I'm gonna go with the DCT Goldwing in the silver with the blackout and add the Tour trunk with rack and center light, center stand, rider backrest, and foot shifter, comes out to ~$27 on the Honda site accessory calculator. I'd love to get one of the Goldwing Tours but I don't want the chrome and don't want to wait for 2019 when I bet they do a Tour model with the blackout. Doing it this way actually comes out less than the DCT Goldwing Tour but then I have to add install cost, I do lose a couple features doing it this way that I'm ok with to have it blacked out. Not too bad on lost items. Heated seat, elec. damping adjust, shorter windshield and electric preload loss, rear speakers and HSCT. Windshield and heated seat can be upgraded, probably speakers too. So set the damper manually, not a big deal. Color is definitely the best. I probably will, just going to wait for the bag fix and I'll upgrade the seat for wifey if the pass section is upgradable, but from Cycle World, looks like it may only be the rider portion. Page created in 1.104 seconds with 26 queries.